Each horizontal grid line holds just one word. Letters already in the grid are unique. Missing letters are above the grid. Patterns are presented in boxes below the grid. 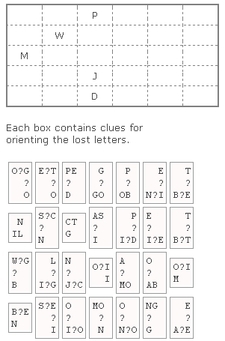 Using these patterns, drag a missing letter from the top of the puzzle into the grid. If the pattern includes dots or bars, the letters are somewhere in the row (...) or column (bars) but NOT ADJACENT. If the clue is a pair of letters (eg SE TR ZI), they must be placed ADJACENT in the grid (up or down as indicated). If you have placed wrongly, tap the letter to return it. Look for pairs of letters that match one of the starter letters first. Start with double letters in the patterns. Starter letters (those already shown in the grid) are not duplicated. 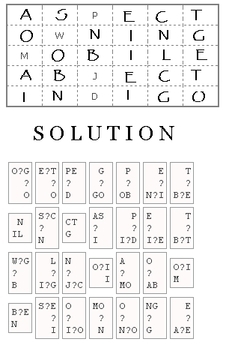 Use process of elimination for guessing some letter positions. 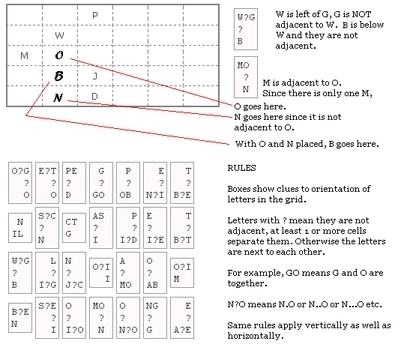 Look for junctions of known letters. Need to cheat to find a word. Use More Words to find words by pattern. Opens up in a new browser window. Copyright © 2005-2018 Brainy Games - Knowledge Probe Inc..